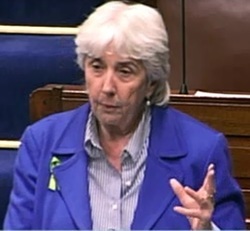 Maureen spoke on Organ Donation Motion; Sexual Offences Amendment; Housing (Amendment) Bill 2013; Good Friday Agreement Motion; Alcohol Sales Legislation; Ireland & the €urozone Motion. Click on images to hear Maureen speaking and scroll down this page to see the full texts of those contributions. Nuair a thosaigh an díospóireacht maidir leis an EU blianta ó shin, caithfidh mé a admháil nach rabhthas riamh ina bfhábhar. Cheap mé go mbéimid i bfhad níos fearr fanacht amach but the people voted several times and that is where we are. I am glad I live in a democracy. I believe in democracy, particularly as a woman, when I think of those countries where there is a lack of democratic rights because people live under dictators or despots. However, our democracy is being seriously undermined by the decisions that are being made about us, our society and our economy outside this country. As the motion states, we are under the control of the ECB as a member of the eurozone. Coming down the line is an unelected EU Commission setting out a range of fundamental EU treaty changes. How is that democratic? We spent 800 years under British occupation and we have had approximately 90 years of independence. I wonder whether we value this independence and why the Government is content, for whatever reasons, to allow the Union to be master of our destiny. I acknowledge the work of Deputy Pringle in getting this topic aired in the Chamber and in opening up a proper discussion on the eurozone. There was a nationwide public consultations process for the review of the White Paper on Irish Aid. It was a good process and I would value a similar process to examine our membership of the eurozone. Like Deputy Catherine Murphy, I am a member of the constitutional convention and there may be a role for the convention in this regard when we conclude the eight specified topics under discussion. Our President recently asked what we mean by "European" and by "the Union". These are the central issues that should be addressed in the public debate. Two phrases apply to our membership of the Union - one is putting all one's eggs in one basket and the other is the little fish in the big pond. An unlimited supply of money to banks and states led to a crash and nobody wanted to hear the words "Enough" or "Stop". We then had the massive blanket bank guarantee here followed by massive devastation and burdens on eurozone members, including Ireland, Greece, Cyprus, Spain and Italy. We are members of this EU club and being a member of a club carries responsibilities, which I accept. However, we also have rights. Some of our rights are being eroded. Where is the justice for people in bailing out every bank and bondholder and implementing austerity? There is little equality and democracy in the EU club. We are paying disproportionately and those who had the least to do with the banking crisis are paying the heaviest price. I support the Ballyhea Says No campaign to meet high level ECB and Commission officials to discuss these matters and for them to hear the voices of ordinary people instead of the voices of politicians and their officials. The fiscal political union has done little to address the social pact, which was an original fundamental of the Union. I was impressed by what the President said when he referred to the loss of social cohesion and the deficit of democratic accountability. He reminded us of what European values were - personal dignity, freedom, democracy, equality and rule of law. Those values are being seriously undermined because we are not seeing an EU that is inclusive or respectful of equality; we are witnessing an unelected Commission determined to pursue the establishment of the great European marketplace that will protect certain people in institutions with little or no regard for ordinary people like the unemployed and the disabled - daoine ar an imeall. We had a lovely video from an inner city school a few years ago, "Give Up Yer Aul Sins". It is time we had a similar one entitled "Give Up Yer Aul Austerity". Membership of the eurozone has to be a vehicle to benefit all in Irish and European society. We are giving away control of our economic destiny but alarm bells rang when I read about Mr. Barroso wanting to transform the EU into "a federation of nation states with increasing powers for Brussels". He further said: "The world needs a Europe capable of deploying military missions to help stabilize the situation in crisis areas... and to begin truly collective defence planning." Our Army has done great work as a peacekeeping organisation and it has a role working with armies in the developing world on human rights and on the treatment of women. I would like to keep our membership of the Union under review regarding its benefit to the people of Ireland and not just its benefit to certain sections of our society and provided we can preserve our autonomy. Question 506. Deputy Maureen O'Sullivan asked the Minister for the Environment, Community and Local Government in relation to SDZ for Grangegorman if his attention has been drawn to the serious issues of residents in relation to the location of waste storage/sorting/cleaning compound which they feel is in breach of the Grangegorman Draft Planning Scheme as approved by An Bord Pleanála; and if he will make a statement on the matter. Minister of State at the Department of the Environment, Community and Local Government (Deputy Jan O'Sullivan): On 21 December 2010, the Government designated Grangegorman as a Strategic Development Zone (SDZ). On 25 July 2011 Dublin City Council decided to make the Draft Planning Scheme submitted by the Grangegorman Development Agency, and on 2 May 2012 An Bord Pleanála approved the making of a Planning Scheme for the Grangegorman SDZ. Any breach of the Planning Scheme is a matter for the Grangegorman Development Agency and Dublin City Council. My Department understands from the Council that the matter raised is currently being investigated with a view to resolution as expeditiously as possible. I have no function in relation to any breach of the Planning Scheme. 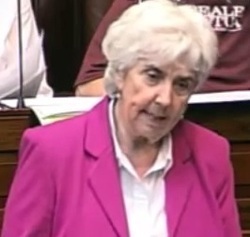 Deputy Maureen O'Sullivan: Táimíd an-bhuíoch go bhfuil síocháin againn agus ba mhaith liom aitheantas a thabhairt do gach éinne a ghlac páirt. Undoubtedly, the North is a different place because of the peace process and the Good Friday Agreement. I wish to remember those who lost and gave their lives, the many who suffered, those who compromised and engaged in the process and the leaders involved, for example, Bertie Ahern, Tony Blair and Mo Mowlam, as well as those who worked behind the scenes and Nationalist and Unionist leaders and communities. I am a member of the foreign affairs committee. When we meet people from conflict areas, they take great heart from the Northern peace process. After generations of bloodshed, bitterness and deep division, peace was achieved. No one wants to see it undermined, but that is what is happening. Lasting peace cannot be achieved without justice, something that is being undermined in the North. 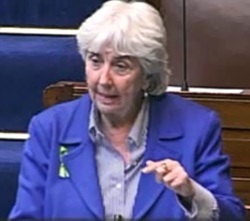 I have raised the issue of prisoners at Maghaberry prison in Priority Questions and Topical Issues. With a group of Deputies, I visited the prisoners several times. Their human rights are being abused. I am not referring to their political views. How could a dirty protest continue for 18 months without anyone paying the prisoners a blind bit of notice? We have been told that the agreement is not being implemented in the prison. Regarding Ms Marian Price, how could a royal prerogative of mercy that received significant coverage when given be lost so suddenly? She is the only female being held in isolation in a male jail. Her medical treatment leaves much to be desired. These are abuses of her human rights. Her hearing with the Parole Commissioners is repeatedly postponed. She has been held two years on the basis of allegations. Equally disturbing is the case of Mr. Martin Corey, who has been in jail for three years having had his licence revoked on the basis of allegations. Following a judicial review, the judge opted to release him, but the Secretary of State prevented that from happening. He is long overdue a parole review. It will not be held until July. This is internment without trial. In a democracy, due process should be followed. Level a charge, bring a person to court and let him or her have a say. If there is a conviction, it can be appealed. Otherwise, the person serves time. So-called evidence is being produced, but it will be closed. Barristers and solicitors will effectively be going into the case blindfolded. The sword of Damocles is hanging over others who are out on licence. We have had the Birmingham Six and the Guildford Four. We now have the Craigavon Two, men who are being held following a series of allegations, dubious circumstantial evidence and serious issues relating to the PSNI and the covert surveillance of civilians. These injustices are putting the peace process in jeopardy. Do we never learn from history? Are we trying to create more martyrs and fill the ranks of dissident groups? I believe in people's democratic right to a fair trial. People in the North are being denied this right. Those being held on grounds of dubious allegations are not the problem. Rather, they would be a part of the solution if the situation was being addressed correctly and fairly. Priority Question 78. 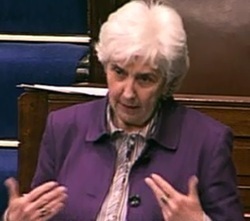 Deputy Maureen O'Sullivan asked the Minister for Health in response to the recent statistics on the physical implications of alcohol abuse, including liver disease, as published by the Royal College of Physicians of Ireland, Reducing Alcohol Health Harm, the strategies he intends to take to tackle the abuse and misuse of alcohol particularly in the young population where alcohol/drug abuse and misuse also leads to anti-social behaviour, violence and poor relationships. Minister of State at the Department of Health (Deputy Alex White): The problems of alcohol misuse and the recommendations to deal with these in the report of the Royal College of Physicians of Ireland are similar to those reported by the substance misuse steering group. Both reports provide a robust analysis of the problems of alcohol misuse and key recommendations based on a thorough review of national and international evidence. I will be submitting proposals to the Government very shortly to deal with the misuse of alcohol. These proposals are based on the recommendations of the substance misuse report. These proposals are real and tangible, and cover all of the areas mentioned in the latter report including, but not limited to legislation on minimum unit pricing, which is about setting a statutory floor price per gram of alcohol; access and availability of alcohol, including separation of alcohol from other products in retail units where alcohol is sold; and advertising and sponsorship. The Cabinet committee on social policy has already considered these proposals and in developing them. My officials and I have also had frequent discussions with a number of Departments. At the same time, work by my officials on developing a framework for the necessary Department of Health legislation governing, among others, minimum pricing, has continued. For example, in conjunction with Northern Ireland, a health impact assessment is being commissioned as part of the process of developing a legislative basis for minimum unit pricing. Scotland commissioned the same sort of assessment when it was developing its legal framework on minimum unit pricing, approved in the Scottish High Court only last week on 3 May, which I am very pleased to see. The health impact assessment will study the impact of different minimum prices on a range of areas such as health, crime and likely economic impact. 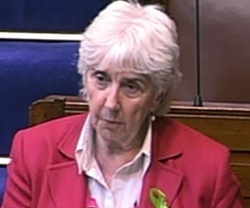 Deputy Maureen O'Sullivan: I thank the Minister of State and wish him well with bringing those proposals to Cabinet. I hope they make progress. There is no doubt we have a very unhealthy relationship with alcohol and the statistics on the role of alcohol in murder, assault, sexual assault and public order offences is frightening. Particularly frightening is the increase in liver disease particularly among young people. An 18 year old woman was the most recent casualty of that. We are moving away from what was our pub culture, which was centered on the pub as an occasion to go out to socialise and meet people. Now we have a very serious situation where, when purchasing a bottle of milk or petrol and one can also buy alcohol. These are very serious issues. Young people can dial to have drink delivered to their house and nobody is checking the age. That must come into the Minister's deliberations. The later people start drinking the better so we must examine underage drinking. Last week I was involved in a youth convention with five schools from the north inner city and what emerged was frightening. More than 95% of them, whose average age was 16, were drinking regularly. Deputy Alex White: I agree very much with what Deputy O'Sullivan has said and the insight she has brought to this. I recently met with members of the Royal College of Physicians and had the opportunity to discuss these issues with them. The Deputy has outlined some of their concerns in her question. Although the proposals have not yet gone to Cabinet, the proposals I regard as important are also regarded as very important, relevant and necessary by the Royal College of Physicians. The Deputy mentioned the increasing instance of liver disease and she is right about that. On the broader population issue, the risk is very high for young people in particular, particularly older teenagers and those coming into adulthood, and it must be addressed. Deputy Maureen O'Sullivan: I am also having a meeting next Tuesday and delegates include Professor Joe Barry and somebody from the Royal College of Physicians. We looked at marketing and certain advertisements that the drinks companies were coming up with, which were very clever and glamorous. Young people spoke about how these advertisements associated alcohol with having fun and being healthy, with confidence-building and having relationships. The whole area of advertising must be looked at. When I met people from the gambling industry recently I asked them about the possibility of a levy related to gambling addiction. What contribution will the alcohol industry make? If it is making any, its contribution should be much more about these alcohol-related issues that cost everybody so much. Deputy Alex White: Each of the issues the Deputy has touched on has exercised me in the course of the preparation of this memo to Government and the intended preparation, for the first time, of public health alcohol legislation. We have a public health perspective on this issue. Traditionally, our only perspective on this in terms of public policy was the licensing laws. These laws are very important, of course, and are one of the reasons we have had such a proliferation of outlets where alcohol can be obtained. However, my perspective and that of my colleague, the Minister for Health, on this is public health and that is what we are bringing to bear. I hope and expect a broad degree of support for the measures I am proposing. 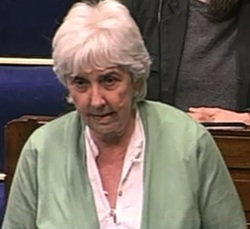 Tá ceithre bliana déanta agam istigh anseo mar Theachta Neamhspleách don dáilcheantar Baile Átha Cliath Láir. Ceapaim go mbíonn cúrsaí tithíochta i measc na fadhbanna is mó a ardaítear liom gach lá. Every single day, my office gets numerous calls on housing matters and problems of one sort or another relating to housing. I would love to see a strenuous and comprehensive campaign and programme to take on all of the aspects of housing, whether it is local authority housing, private rented housing, ghost estates, the role of NAMA or the housing associations. An ancillary problem that is very bad in Dublin Central is the issue of waste management and illegal dumping, which is becoming almost a plague in certain parts of the inner city. It keeps being pushed between the local authority and the Department and there is not a very strong programme to deal with it. In considering the Bill, one issue is the harmonisation of rents with the local authority and the housing assistance scheme. I know the Bill will see responsibility for long-term rent supplement recipients moving from the Department of Social Protection to the local authorities. One point that is very positive about Bill is that it will take into account the financial circumstances of households. We know that household circumstances do change in the changing economic climate of today. Therefore, a rent that was appropriate at one time in a particular circumstance will not be appropriate at another time. The issue of dependants is another that comes up constantly, particularly with regard to how many people are on the floor and off the floor. We need a very efficient system to deal with this. I deal with the Dublin City Council offices in Sean McDermott Street, Parnell Street, Cabra and the Civic Offices. I want to acknowledge the co-operation of Dublin City Council and the hard work of the staff when I and those in my office are in touch with them on the variety of issues that arise when dealing with housing. With regard to estate management, it is a feature of the local authorities that they have a method of dealing with issues that arise. Much of this has to do with anti-social behaviour, violence and drugs. At least when it is local authority housing there is a mechanism under which the tenants and the local authority can be brought in and there can be a mediation process which will deal with the issues. We know there are certain tenants in local authority areas who cause havoc for the other residents living there and make life unbearable for those who want to live their lives in a peaceable way. There are a number of "buts" that have to be addressed when it comes to local authority housing. First, there is a major shortage of public housing in Dublin Central, where there are more than 2,300 households on the north inner city housing list, which covers just one part of the constituency, and more than 800 of those have been on that list for over five years. At the same time, there are at least 120 vacant council housing units in the area but Dublin City Council does not have an adequate budget to bring them into use. It is very disappointing, when going about the different complexes and housing estates in the constituency, to see these perfectly good houses and flats boarded up when some work could turn them around quickly. In fact, the turnaround period is getting longer. There are places waiting over three years to be turned around when, at the same time, we are looking at very long housing lists. It comes down to a funding issue. Dublin City Council is dependent on an additional budget from the Department of the Environment, Community and Local Government to hire contractors to carry out this work. As a result of that shortage of public housing, people on the housing list are being directed more and more into the private rented sector. More than half of households in the north inner city are in private rented accommodation. This now seems to be Government policy, because the Department of the Environment, Community and Local Government housing policy statement in June 2011 foresaw an even greater role for voluntary and private housing sectors in meeting housing needs in the future. That will mean an increasing reliance on the private housing market at a time when supply in that area is under fierce pressure in the city. We know the pressure on the private rental market in Dublin is leading to higher than expected rent increases. This morning I read the report from Threshold containing its latest figures. The latest index figures reveal an overall average monthly rental figure of €785 on a mid-adjusted basis. However, rents in Dublin are averaging €974. Nationally rents have increased by 2% compared with the figure in the first quarter of 2012. We know there are large numbers of landlords who are not registered with the PRTB. This means their tenants are more likely to make up top-up payments which mask the real rent levels. The bottom line is, however, that rents are too high. The PRTB index shows that the strategy of the Department of Social Protection aimed at bringing down rents by reducing rent supplement has not worked because rents are staying stubbornly high. I agreed with the Minister because I thought that bringing down the level of rent supplement would bring down rents because people were paying far too much for the accommodation they were getting. However, the strategy has not worked and must be looked at again. I also see tenants trying to negotiate with some of these landlords on retns and other issues being put at a very strong disadvantage. As I have been trying to raise an issue during the Topical Issue debate for the past two weeks without success, I will talk about it today. It concerns an alarming report on housing from Dublin City Council. It was produced with funding provided by the Department of the Environment, Community and Local Government for Dublin City Council on an intensified inspection system. The council inspected over 1,500 private rented dwellings, mainly in two areas in the north inner city that are notorious for having very poor landlords. It found that over 90% of flats did not meet basic standards; therefore, 90% of people in certain areas are living in accommodation that is completely unsuitable. Some of the problems in 1,400 of the 1,500 dwellings include unsafe electrics, no private bathrooms, rooms without windows, damp, mould and inadequate heating. What is happening in these parts of the inner city marks a return to the tenements about which Seán O'Casey wrote in plays such as The Plough and the Stars and Juno and the Paycock. We are back to slum conditions which I see in my constituency. Tenants will rent perhaps one or two rooms and then sublet; sometimes there are no adequate figures for how many people are living in some of these tenements. Landlords were served with over 1,500 notices to improve their flats, which is fair enough. This new system of inspection involves choosing an area. What is alarming, however, is that under the inspection programme, a property cannot be re-let until it is brought up to standard but existing tenants can remain in situ. The tenants in the 90% of accommodation that is substandard are forced to continue living in it. All it takes is for the unsafe electrics to go on fire and we will have a situation akin to what has happened in factories in Bangladesh. It is appalling. I welcome the money granted, but there is no point in finding out that something is wrong unless the system is in palce to do something about it. That is the issue. I have another question about some of the landlords involved: are they tax-compliant? Again, I do not think we know the answer because so many of them are not registered with the PRTB. The report also states 75% of those landlords in Dublin who split houses into flats did so illegally. Therefore, in addition to tenants subletting, landlords have gone down that road also. I know that some tenants in private rented accommodation are causing untold problems for the communities in which they are living. I hear about these problems at every community forum meeting I attend. They range from anti-social behaviour, violence, dumping to total and utter disregard for the community. Unlike local authority housing, there is no redress system. One community had to wait over one year before it, the local authority and the Garda eventually got the landlord to do something about it. In that year the lives of people living on either side of this particularly unruly rented dwelling were made miserable. It affected their mental health and shattered their peace of mind. There is a real need for this issue to be dealt with and I do not know if the PRTB can take it all on. Again, it goes back to the increasing demand on the private rented sector because local authorities do not have enough housing available. In parts of the inner city there are lovely apartment complexes that are beautiful inside but which have no play areas or open spaces for children. Some of these apartment blocks house single people or couples who have no children; therefore, they are not particularly interested in having a play area and do not want to hear children kicking a football around. The lack of adequate play spaces for children living in apartment complexes is causing problems. We are talking about encouraging people to exercise more and children getting out into the fresh air, but if they are living in some of these apartment complexes, there is no safe area for them to play in. There is no doubt that there are problems with homelessness. Again, this is happening at a time when budgets are decreasing and it is in the inner city and parts of central Dublin that there is an amount of accommodation available for homeless people, which is valuable. However, homelessness is not confined to Dublin city; it affects other areas also. Therefore, these facilities must be spread. They are very welcome, but there is a need for more of them and we need to look at where services are being provided. We know the housing associations are doing great work, but I would like to see regulations in order that if there are problems with tenants, there will be a mechanism in place to address them. In 2012, 484 NAMA properties in the Dublin City Council area were identified as having the potential to be used for social housing. This is another process that is proving to be incredibly slow and very cumbersome and awkward to deal with. We have people with housing needs and housing is available in some cases, but the dots are not being joined. Housing is a huge issue. There are so many pieces of the jigsaw, but they are not coming together. There is, therefore, a need for a comprehensive programme on housing generally. Gabhaim buíochas don Teachta Tom Fleming as ucht an obair a dhein sé ar an ghnó Comhaltaí Príobháideacha seo atá á phlé againn. I will begin with a personal story. Some years ago a young male relative of mine contracted a viral infection when working abroad. The hospital where he was treated identified that he would need a heart transplant at some stage. He came back to Ireland and over the next year or so his physical deterioration was visible. During that time he received various treatments, medication and procedures in the cardiac section of the Mater hospital. Eventually, he had to be taken into hospital because it was identified that he needed a heart transplant. He was connected to machines to keep him alive. When visiting him in hospital during those weeks the care and dedication of the team was obvious. We were also aware that in order for him to get a heart it would mean another person losing his or her life. While hoping for life for him we were also conscious of the implications of that. I spent a couple of weeks visiting him and then I remember getting a call one afternoon from his mother to say that a heart had become available and she asked me to stay with them while they were waiting. I went straight to the hospital. I clearly recall the emotion and tension during the wait while tests were carried out on the heart and various other procedures to see whether it would be a match. Once the word came that it was a match I can remember the rush to get him into the operating theatre. It was about 11 p.m. and we thought we would be there all night but the operation was relatively short and after a couple of hours the surgeon same in to say it had been successful. I would love to say that the story had a happy ending, it did not but he did get about three or four years with the new heart, which gave him a great life, one that he did not have for the previous couple of years when his health was deteriorating. Unfortunately, he passed away in spite of getting a new heart. Being in that situation made me realise the importance of organ donation. I had always carried a card but that experience brought it home to me how vital it is that we are aware of the need for organ donors. I am conscious of the other lives that might have been saved if more people carried organ donor cards or if families or next of kin knew the wish of their loved ones to donate organs in the event of the situation arising. As the motion states, it is important to emphasise the incredible generosity of families who give consent for donation because it is at a time of great stress and great loss for them. The motion refers to the Spanish and Croatian experience where there is a cost saving. Apart from the moral and ethical reasons, there is also an economic one. In Croatia, organ donation structures resulted in increased donation rates to 30 per million of the population compared with 18 per million of the population in this country. What is significant in Croatia is the network of hospital physicians responsible for organ donation within intensive care units and also that the legislation there was adjusted to include the opt-out in keeping with Spain, Belgium, Austria and Portugal. The countries that have made serious efforts on organ donation and transplants have seen major benefits, both medical and financial. This country did have one of the highest rates of donation but, unfortunately, it has fallen. It is interesting to note that in 2010 there was a record low of 58 donations, in 2011 there was a record high and in 2012 the figures were below average at 17% less than the previous year. The first step is to introduce legislation as that is a major way forward. Another step is to intensify a public awareness campaign to address the need for donors. One aspect of that is the opt-in system for organ donation. If a person decides not to be part of the system, he or she can sign out of the automatic donor scheme. Those who do not wish to donate have an opt-out, otherwise they are presumed to have opted in. According to Mark Murphy of the Irish Kidney Association, even in countries which have the opt-out clause the law still dictates that relatives have the final say and can veto any decision. Presumed consent is not always feasible in practice. If presumed consent is the way forward in this country then citizens must be informed and know as much as possible. A donor should be able to have the satisfaction of knowing that he or she will be a donor if the situation arises. A clear public campaign is needed in order for people to know what they are doing and that it is a very important civic duty. Equally, the campaign must ensure that people who opt out know the position. It must be phrased in language that can be understood by everybody, including those who have literacy issues. Demand is outstripping supply. Organisations such as Falun Gong tell us of the growing black market for organs. That can be eliminated if we all have the same system of presumed consent. I note that a couple of years ago the Irish Medical Organisation advocated for a hard mandated choice model which takes away the burden of decision-making from the family. That would help both the family and the medical workers during times of traumatic or sudden death. The team in the Mater hospital was excellent. I can see the need for more such teams with trained personnel to co-ordinate the donor system so that we have qualified donor co-ordinators in hospitals across the country. It is important to acknowledge the three transplant programmes we have in Beaumont Hospital, the Mater hospital and St. Vincent’s Hospital. Because of the increasing pressures on them there is a need to ensure that the work is not just confined to those three hospitals in Dublin. We know the cost effectiveness of organ donation. Treatment for people waiting for organs costs the health care system more than the organ transplant operation so investing in donor co-ordinators would be cost effective. I read a recent article by Professor Jim Egan in The Irish Times. He also made the point about the need for an independent national organ procurement office. If we had different policies on alcohol, drugs and diet we could eliminate some of the need for organ transplants. In the article to which I referred, Professor Egan outlined that there are 685 people awaiting transplants. I know the stress of waiting for a transplant for my young cousin and I can only imagine what those families are going through now as they wait for another family to experience loss and distress so that their loved one will have a chance of life. Organ donation and transplantation in Ireland is at a crossroads. With both the proposed “soft opt out” legislation and infrastructure support there is an opportunity to provide enormous benefits for generations to come.